It only took a few days, current IKON employees are starting to weigh in by articulating there emotions and thoughts on their personal blogs. As well as some astute observations by some outside our industry. "...So I used to tell my wife, "If I had to leave IKON for another copier related company... it would probably be Ricoh." What I didn't totally anticipate was Ricoh coming to me..."
"The Dutch take over our beer, now the Japanese take out office solutions. What’s wrong with this picture?" "In the short-run, Canon is the biggest looser but in the long run HP will be. However, the biggest winner will be Xerox; It will help defend its turf against the print-centric assault by HP while aggressively targeting IKON-Canon customers during merger integration via its subsidiary of Global Imaging Systems. Having picked a much less problematic dealer group (Global vs IKON) to acquire, Xerox will have a window of opportunity to better compete against Ricoh particularly in the US middle market." "It is interesting to me Ricoh buys IKON for $1.6 Billion or $17.25 per share. A little over a year ago Xerox bought Global Imaging for $1.5 Billion or $29 per share." "The Ikon acquisition should have minimal impact on Ricoh's dealer and IT channel partners", says Russell Marchetta, manager of corporate and public relations with Ricoh. He notes Ricoh and Ikon have been partners for more than 20 years and they've always considered Ikon a separate distribution channel within their organization, in addition to the independent dealers and their direct business. " Ikon was four times the size, but was purchased for the same dollar amount. This clearly shows a significant difference in value between IKON and GIS. Absolutely, I do not think that Xerox paid too much - I agree with you and others that Ricoh is getting a "sweetheart deal" on IKON. 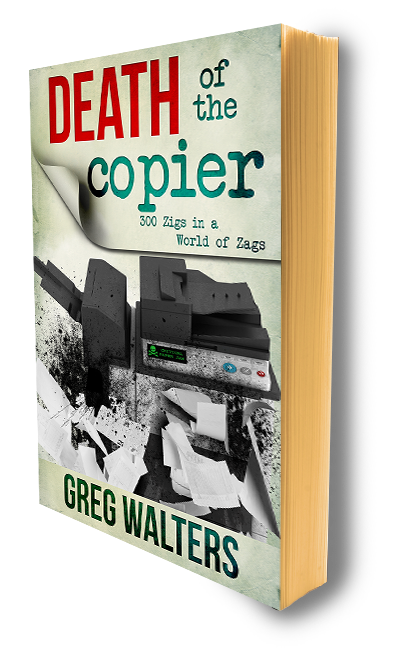 It is interesting - 4 times as big, and sold for the same amount - I wonder how the strength of the dollar plays in..
Copier Crime - From the "Dirty D"
The New SalesPerson - Death of the "Close"
IKON to cut 250 jobs: "Business as Usual"
EDS - Mangaed Print Services??? ?